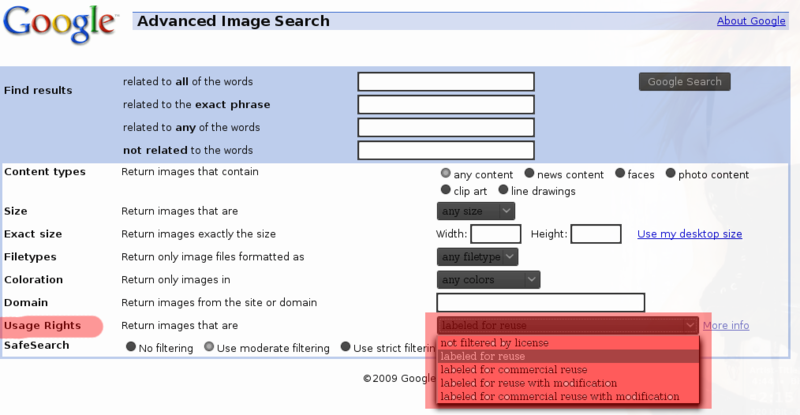 Google Image Search can now search Creative Common Images! Google has added a feature in its image search engine to search images based on the license of the image. 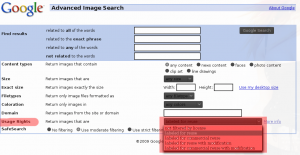 Before this, when we search for an image results are displayed irrespective of what licensing they are under. This meant that if we are looking for images to use in a, say, blog, we have to look up the usage rights of each images separately. Now, we can search for images under Creative Common licensing form Google Image Search itself, so that we don't spend hours trying to find reusable image amongst copyrighted images. It is possible to seach images under different licensing like those for reuse, commercial reuse, reuse with modification and commercial reuse after modification. This may also a great way for artists to get their works noticed. By putting their work under proper license, it is possible that their work will get more attention. To use this feature, click on the Abvanced Image Search link in the Google Image page. Then, choose the type of licensing desired from the dropdown menu for Usage Rights. If you want read the post in the Google Blog announcing this, here is the link.